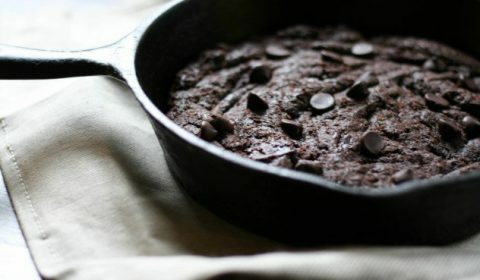 This skillet brownie is so chocolaty sweet you won’t even realize it’s free of any grains, nuts, or refined sugars! 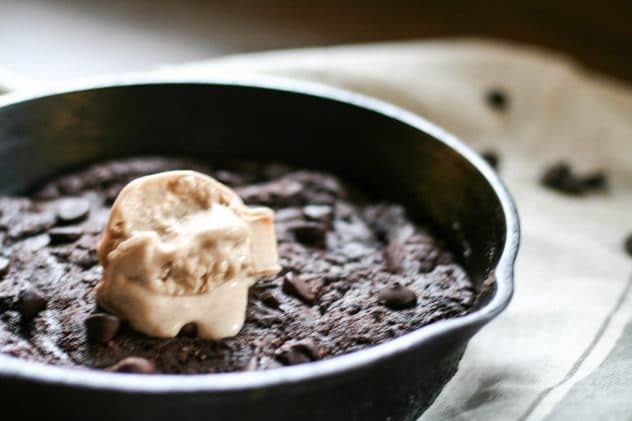 Add in the fact that these are Paleo approved and you’ll be in heaven. I have to admit, I’m really not a big chocolate eater. Just a few bites and I’m good, but it’s those few bites that give me my quick fix for something sweet when I want one. I may or may not have eaten these brownies as part of my breakfast a time or two. I like to think that anything cooked in a cast iron skillet just tastes better. Am I right? 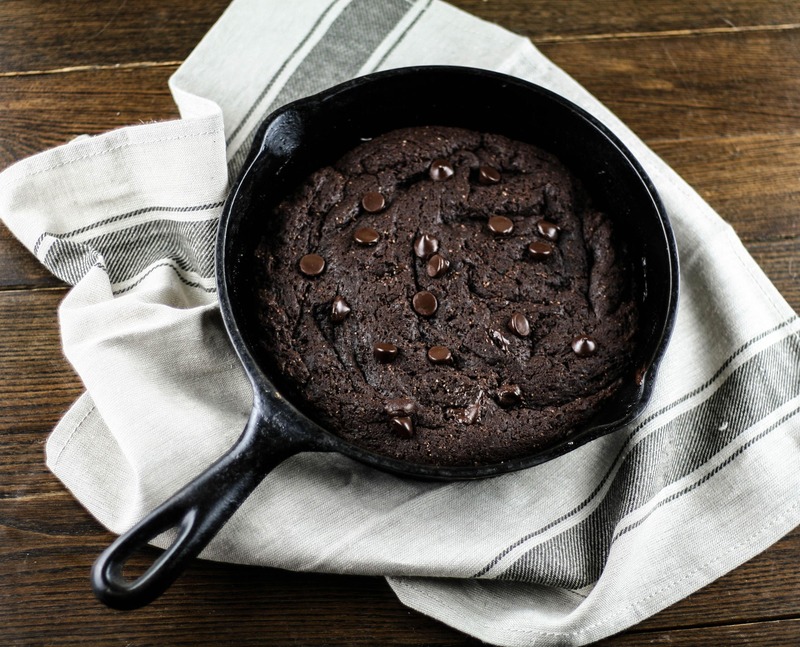 I’m finding more and more recipes I want to cook in my cast iron skillet, so many I may have to create a Paleo cast iron cookbook. Cooking with cast iron makes me think of an era gone by, back when cooking was a craft. Today’s generation is always on the go, food done fast, I’d like to get back to a time when food was created through an almost artisanal process. You know what makes these skillet brownies even better?? Ice cream! I’ll share my super easy cinnamon banana ice cream recipe that’s dairy free (but you wouldn’t even know it!) You might ask, “brownies and ice cream, and it’s Paleo friendly, and not full of refined sugars and chemicals?! ?” You bet! Whip these up and enjoy. Grease an 8 inch cast iron skillet well with a thin layer of coconut oil. Add the mashed banana, salt, vanilla, and eggs, and mix together. Add in both flours and stir until combined. 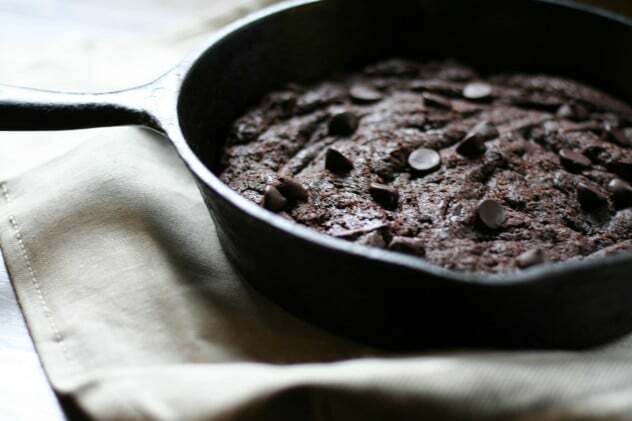 Pour the batter into the cast iron skillet and top with additional chocolate chips.